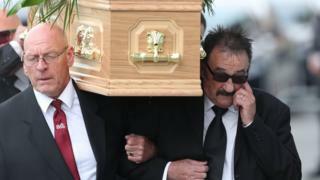 The funeral of Barry Chuckle, one half of the comedy duo the Chuckle Brothers, has been held in Rotherham. The service was held at Rotherham United football club, of which Barry was an honorary life president. The funeral cortege was greeted by applause and shouts of the brothers’ catchphrase by hundreds of fans gathered outside the ground. Barry’s younger brother Paul was among those who carried the coffin in through the players’ entrance. Paul had described Barry as his “very best friend”, after his death on 5 August following a short illness. Famous faces including Roy Chubby Brown, Vicki Michelle, Linda Nolan, Bernie Clifton, Tommy Cannon and Billy Pearce were among those invited inside the stadium. Yorkshire comedian Billy Pearce said: “I think Barry would be honoured and elated to see that so many people loved him so much. Vicki Michelle, of ‘Allo ‘Allo! fame, said her favourite memory of Barry was a night out in Birmingham where they were appearing in panto together, and seeing Barry “dancing in a Chuckle sandwich with a girl either side of him”. She said wherever he went people would call out, “To me, to you”. 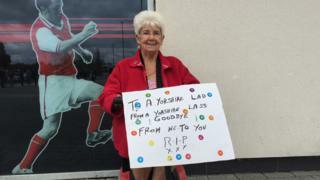 About 400 fans gathered outside the ground to pay their respects. Lisa Scranage, 45, and her fiance Mark Kitchen, 37, got to the stadium with her 14-year-old son Ryan at 10:00 BST, having travelled from Featherstone. 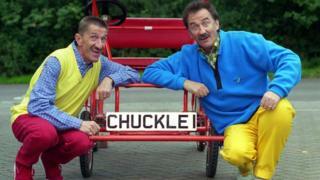 Ms Scranage said she first watched ChuckleVision as a child after school and her love of Barry and Paul grew from there. She went regularly to shows and often stayed behind to chat to the brothers, becoming friends with them. 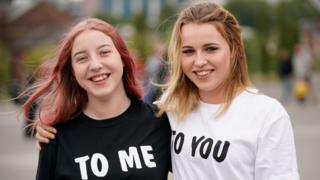 “They have given us so much over the years as the Chuckle Brothers, so this is the last chance to give a little bit back to Barry, to say goodbye and pay our respects,” she said. The couple had asked Barry Chuckle to come to their wedding. 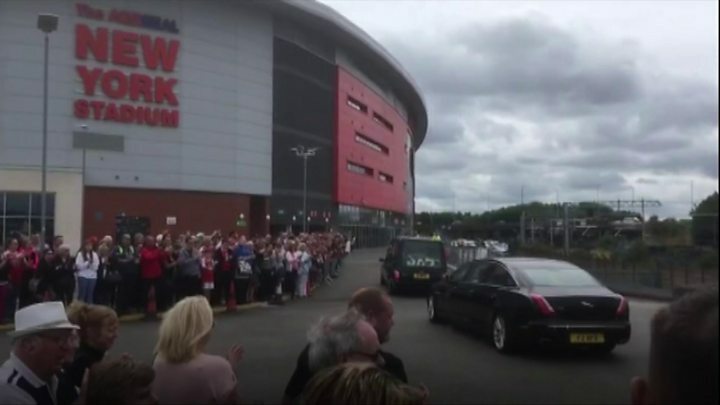 The road up to the stadium was lined with hundreds of well wishers, keen to say goodbye to Barry. Some had arrived as early as 10:00 to find a spot, travelling from across Yorkshire and further afield. All the people I spoke to were delighted to share their happy memories of growing up watching him and his brother on TV or in pantomime. The famous faces he worked with through his career all painted a picture of a man who was a joy to work with and will be dearly missed. As the hearse approached a ripple of applause broke out among the crowd and a few shouts of “To me, to you” could be heard. 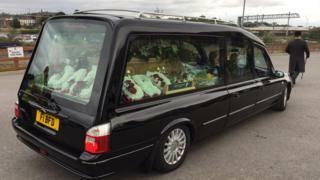 There were at least a few people who shed a tear as his coffin was carried in to the stadium for the private service. Will Cowan, 18, from Doncaster, came wearing a Chuckle Brothers T-shirt. “I can’t remember when I started watching them to be honest – [probably] since I was born,” he said. “It’s been a really nice send-off for Barry. He’s such a legend. 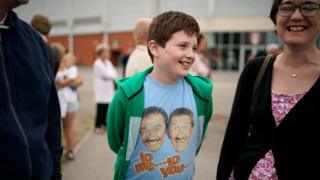 One young Chuckle Brothers fan travelled with his father 100 miles from Birmingham to pay his respects. Alfie, 10, said: “I first went to see them at the pantomime in Wolverhampton around two years ago and I just became a megafan of them. 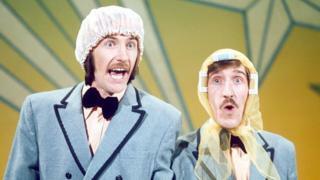 Earlier this year, the brothers returned to television with a new show, Chuckle Time, on Channel 5. Barry had been unwell towards the end of the new show’s filming. Summer work was cancelled while he rested at his doctor’s request, but not long after his health deteriorated.